Panama Canal: Challenge of connecting two oceans of different levels. The Panama Canal: Many would be surprised to know that it runs north to south to link the Atlantic and Pacific Oceans, not east to west. By shortening the route and reducing the cost of transportation between the two oceans, the Panama Canal allows for lower-cost imported goods and commodities in many part of the world. (It saves almost 8,000 miles on a trip from New York to San Francisco.) By eliminating for the majority of shipping the treacherous route around the tip of Argentina, it has no doubt saved countless lives and millions of dollars in lost vessels. However, it is estimated to have cost some 30,000 lives in the two attempts – French and American – to build it between 1880 and 1914. Reducing the distance between the two oceans provides Panama with a major share of its gross domestic product. Some 13,500 ships transit the canal each year, almost 40 a day. Not commonly known is the fact that the two oceans have different sea levels, and different levels of high tide. At the entrance to the Panama Canal, the Pacific Ocean can rise as much as 20 feet, but 45 miles away, the difference between high tide and low in the Atlantic is just three feet. The longest part of the canal, sandwiched between gigantic sets of locks at either end, is manmade Gatun Lake and the Gaillard Cut. Gaillard Cut actually rips through a low point in the mountain chain that runs all the way from Alaska to the tip of Argentina. The Panama Canal has six locks, three near either end. 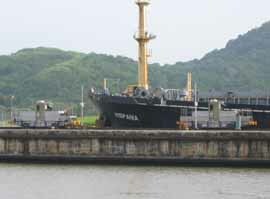 From the Pacific Ocean, near Panama City, the Miraflores Locks' two chambers each raise vessels 27 feet. 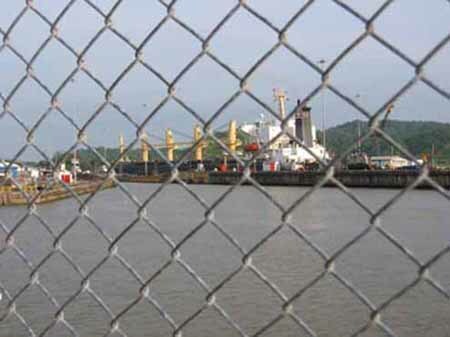 A short distance away, the Pedro Miguel Lock lifts shipping a further 31 feet. Most of the passage through the canal is at 85 feet above sea level. The Gaillard Cut is followed by the town of Gamboa, where the Chagres River enters the canal. Without the Chagres and the immense amount of water that flows from it, there could be no Panama Canal. The three steps of the Gatun Locks each lower ships about 28 feet, to the level of the Atlantic Ocean. The locks are gravity fed from the Chagres and Gatun Lake. No pumps are needed. Water pours through a huge culvert in the center wall of each lock, a culvert so massive that a locomotive could pass through it. Other large culverts pass through the side walls. Water fills or empties through vents along the bottom of the locks, 26 million gallons in just eight minutes. Each lock chamber is 110 feet wide and 1,000 feet long. Each gate weighs 700 tons and is seven feet thick. Each side is 65 feet wide. When the Panama Canal was completed in 1914, the locks were large enough for the largest vessel in the world to pass through. And since then, most marine architects have been careful to design hulls with the canal's measurements in mind. That changed in 1934 when the Queen Mary was launched. She was 118.5 feet wide, but it didn't matter: she was built for transatlantic service, like the Queen Elizabeth, launched a little later. But shipping economics call for ever larger loads. There has been talk for a number of years about widening the canal, one possibility being the construction of wider parallel locks beside the existing ones. One limiting factor could be the availability of water in greater volume. Other options that have been discussed, including building a canal at sea level that would need no locks. One problem with this is the current that would be created because the oceans are at different levels. Another option that Panamanians don't even want to think about is the original idea: the build a canal through Nicaragua. All U.S. naval vessels except aircraft carriers can squeeze through the Panama Canal, and do so without damage, though the occasional battleship loses some paint. The flight deck on aircraft carriers is angled to give greater runway length, and they cannot clear the canal. The world's largest oil tankers cannot make it, either, and have to offload their cargoes to smaller vessels at terminals on either end. Apart from being the crossroads of the world's shipping, the Panama Canal is a great attraction for tourists. There are daily cruises that ply either the whole length or part of it. It's an excellent way to view part of Panama's history, past and present.